If you love the feel of a sport sedan but need something that can also carry a bit more cargo, offers all-wheel drive and looks likes no other crossover SUV on the planet, the 2008 FX35 and FX45 may very well appeal to you. You may not like the FX if you have to carry both cargo and passengers. Some of the FX's more attractive options are grouped into pricey packages and cannot be ordered separately. And the cost of replacing the huge 18- and 20-inch tires every 30,000 miles will not likely be inexpensive. Major changes for the 2008 FX series include new interior and exterior color combinations and the addition of standard XM Satellite Radio. Infiniti describes the FX as a "Bionic Cheetah." The 20-inch wheels (standard on the FX45) seem enormous given the vehicle's short wheelbase and, with its short hood and minimal rear overhang, the FX in the side view seems to be all side doors and big wheel wells. The step-in height is low enough that entry and exit are easy, but the squat rear doors require tall passengers to watch their heads. The 2008 Infiniti FX shares its basic platform with one of Infiniti's most aggressive performance sedans: The G35. This platform creates a nearly perfect front-to-rear weight ratio that allows the fully independent suspension to work superbly. In the FX45, an enormous set of 20-inch wheels and tires delivers a secure connection to the road. While their grip is not in question, the firm ride of these round rubber giants might be somewhat unsettling. Once under way, the FX's steering is tight and linear, responding instantly to the driver's input while the sophisticated suspension keeps the FX nearly level in all but the most extreme cornering maneuvers. The steering can feel a bit heavy due to the large tires, and tight turning circles are not what the FX does best. The FX35's Manufacturer's Suggested Retail Price (MSRP) starts around $39,000 while the FX35 with all-wheel drive starts just over $40,000. The FX45 starts closer to $51,000 and tops out around $58,000 with all available options. If you can live without navigation and a sunroof, the base FX35 is loaded with just about anything you might reasonably want or need. Actual prices consumers are paying may vary widely from MSRP, so be sure to check out the Fair Purchase Price before you set out to purchase. Both the FX35 and FX45 are expected to retain high resale and residual values, a few percentage points behind the Porsche Cayenne, Mercedes-Benz ML and BMW X5, but better than the Cadillac SRX and Lincoln MKX. The 2008 Infiniti FX35's standard features include a five-speed automatic transmission with manual shift and snow-mode feature, rear-wheel drive, power windows, power locks, heated power mirrors, heated leather seats, dual-zone automatic climate control, four-wheel anti-lock disc brakes (ABS), stability control, fog lights, keyless entry, bi-xenon headlamps, 300-watt 11-speaker Bose audio with iPod accessory and a six-disc MP3-compatible CD changer, XM Satellite Radio, power tilt and telescopic steering wheel, RearView Monitor, 10-way power driver's seat with power lumbar support and memory, head-curtain and front side-impact airbags, cruise control, 18-inch alloy wheels, traction control and rear wiper. The FX45 adds a 320 horsepower 4.5-liter V8 engine, 20-inch wheels, all-wheel drive, power sunroof, Bluetooth hands-free phone system, automatic headlamps, aluminum roof rails and a Sport suspension. Options for the FX include all-wheel drive (FX35), Intelligent Key and a rear-seat DVD player. Both models offer a Technology Package that includes DVD navigation, Lane Departure Warning system and Intelligent Cruise Control (requires Hands-Free package which includes Intelligent Key and Bluetooth Hands-Free communication). A rear backup camera allows you to see beyond the narrow rear window. The FX's optional Brick or Espresso leather interiors offer a welcome respite from the usual black, tan and gray. The FX35's 3.5-liter V6 has all the power this vehicle needs and delivers reasonably good fuel economy. The extra cost of the V8 is hard to justify considering you can load the FX35 with every option imaginable for the price of a base FX45. Infiniti's FX35 and FX45 crossover SUVs actually look more like sports cars than light-duty trucks. The racy FX twins definitely stand out in a crowd, but their flashy design sometimes places form over function. The rear hatch opening, for example, is rather small and there is not much cargo space behind the second-row seats. Narrow side glass and a small rear window create large blind spots, although the standard RearView Monitor helps alleviate this concern. 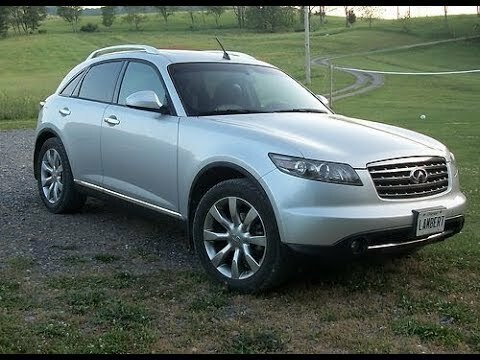 If you can live with these minor shortcomings, the 2008 Infiniti FX's impressive handling and quick acceleration make them the ideal performance crossovers, with expressive exteriors that can definitely turn heads. Driving in luxury, flare, and confidence. It has personality meaning it looks really nice both on the inside and the outside. People always comments on what a nice vehicle I have. It rides like you're in an airplane. It has the sound of when an airplane is taking off. It grabs the road when driving making me feel safe especially going around a corner. The only drawback is it has a somewhat limited visibility inside. I cannot see around the vehicle comfortably when driving. Awesome vehicle for the money..Very dependable.. It is very easy to drive and operate.I've had no major problems with this vehicle.I am a very short person 5'1 so the seats don't adjust enough so I have a Lot of major blind spots.It has a lot of miles on it and it still drives and rides like a new car.I have looked into trading it in for a newer model. It is a long lasting and reliable car. You will not have many issues from the car and does take a great deal of maintenance to keep it going. I like how spacious my Infiniti is, I can move large items and take a good amount of family on a road trip and fit comfortably. It drives smoothly and I do not have too many issues from it. The only issue that came up was a recall with the airbag, but Infinite fixed it free of charge of course.